November already… get ready...have fun, Joy, Christmas! Join us for the most magical unforgettable Christmas Wonderland at the Lemesos (Limassol) Old Port! Fun filled activities and many surprises! 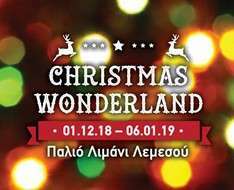 Once again the most magical "Christmas Wonderland" is coming to Lemesos Old Port bringing all the festive spirit to children and adults!!! Opening for the public on Saturday 1st December 2018 until Sunday 6th January 2019. Get ready to share the spirit of Christmas!! !